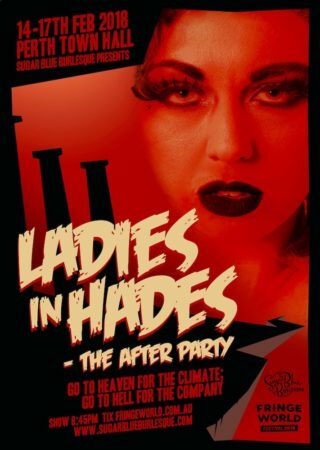 Perth’s premier Cabaret troupe, Sugar Blue Burlesque, presents LADIES IN HADES – The After Party! A one-hour show performed over 4 nights at the gorgeous Perth Town Hall at 8:45pm, Wednesday 14th – Saturday 17th February as part of the 2018 FRINGE WORLD program. Join Sugar Blue Burlesque for an infernal evening of burlesque theatre, where they revel in the stories of the damned debutantes dilly-dallying in the Devil’s lair. Hosted by MC Ginger LaMinge, ‘Ladies in Hades – The After Party’ is devilishly entertaining with its seductive burlesque performances, comedy, sensational dancers and elaborate costuming. The show features a sizzling cast of Perth’s most creative and exciting burlesque artists – Bobbie Sox, Cécile Mimieux, Fifi Fontaine, Kitty Littéur, Lucy Lovegun, Lulu Liqueur, Penelope Pop, The Sugar Duchess, Amelia Kisses & Veruca Sour.